“Dias comes from a former Soviet-bloc region where police routinely are distrusted. Yet when authorities first approached him, he fully cooperated and for nearly 12 hours over two days Dias answered the FBI’s questions without an attorney or a Kazakh Consular official present,” the statement read. At Slate, Azamat's first lawyer, Harlan Protass, has an op-ed arguing against long sentences for the pair. The Government told the court today it expects to call 15 to 20 witnesses at trial. 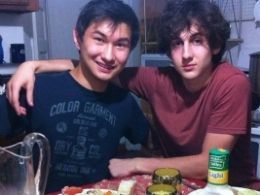 Azamat Tazhayakov and Dias Kadyrbayev have been indicted by a federal grand jury in Boston on charges of Obstruction of Justice and Conspiracy to Obstruct Justice. The Indictment is here. Robelo Philliipos was not indicted. His lawyer says he is still negotiating with the Government.